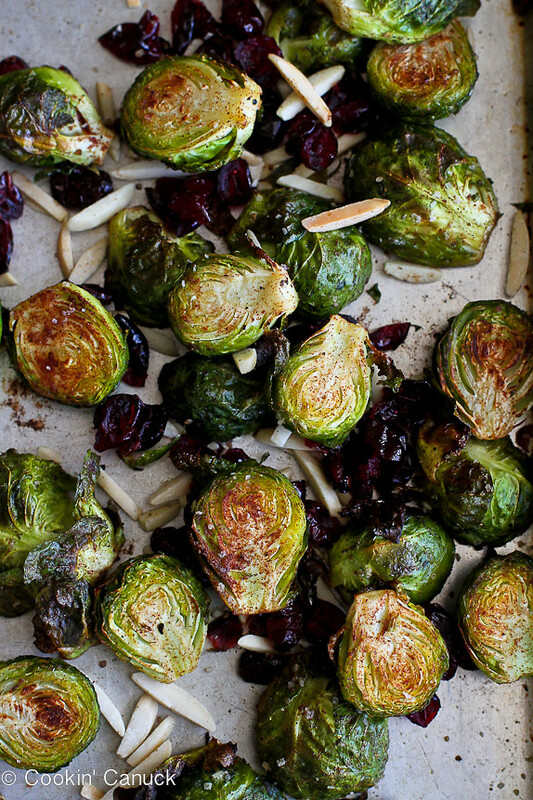 Put aside all of those childhood memories of Brussels sprouts. These roasted ones, with dried cranberries and toasted almonds, will knock your socks off! I am willing to bet some serious cash that if anyone tries roasted Brussels sprouts, they will never (EVER!) boil or steam these mini cabbages again. The same can be said for shredded and sautéed Brussels sprouts, which first made me fall in love with these Thanksgiving-centric vegetables. When I was a kid, “boiled” was the only option. No one seemed to know you could roast, grate or sauté them. That meant one thing and one thing only – my Brussels sprouts magically found their way from my plate to the dog’s bowl. This confession means that I’m going to have some serious groveling to do the next time I talk to my mum. But then I’ll remind her that her amazing gravy was better than anyone else’s! There’s no need to get too fancy with roasted Brussels sprouts. A splash of olive oil with a sprinkle of salt and pepper is really all you need. But I couldn’t resist dressing them up for Thanksgiving. A sprinkle of ground cinnamon, and a dose of dried cranberries and slivered almonds adds just enough holiday flavor to make me a happy girl. You’ll notice a few charred bits in the photos. No, I didn’t get distracted by Instagram, though that has been known to happen. Those little charred bits were on purpose. Believe me, they are too good to resist. This recipe makes four (3/4 cup each) servings, but can be easily doubled for a bigger crowd. If you have a large baking sheet, a double or even triple batch should fit nicely. If you’re conscious of calories and other nutrient counts, you’ll be happy to know that Brussels sprouts contain 45 calories, 3.4 grams of protein and 3.8 grams of protein per 1/4 pound (approximately). They are rich in several anti-oxidants, specifically ones shown to reduce the chances of prostate, colon and endometrial cancer. They are an excellent source of Vitamin C, boasting 140% of the recommended daily allowance per 1/4 pound. Brussels sprouts are also a good source of Vitamin A (think anti-oxidants and healthy eyes) and Vitamin K.
These roasted Brussels sprouts will knock your socks off! Preheat oven to 400 degrees F. Lightly coat a baking sheet with cooking spray. 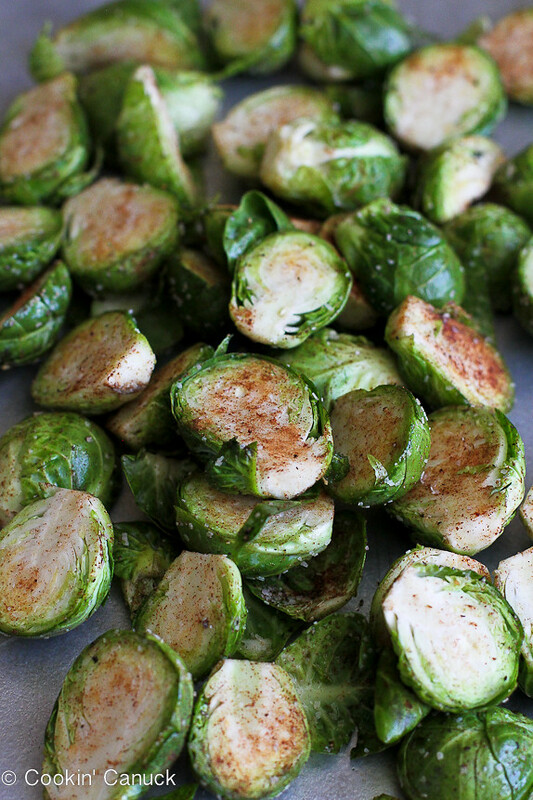 In a medium-sized bowl, toss the Brussels sprouts with the olive oil, cinnamon, salt and pepper until coated. Transfer to the baking sheet. Roast until the Brussels sprouts are starting to brown and are just tender when pierced with a fork, about 20 minutes. Add the dried cranberries and slivered almonds to the pan. Cook for additional 5 minutes. Serve. Brussels sprouts are a really hard sell in our house. I’ve roasted them with honey once and they flew but I really had to do some smooth talking. I definitely think these cinnamon roasted ones would go over well. 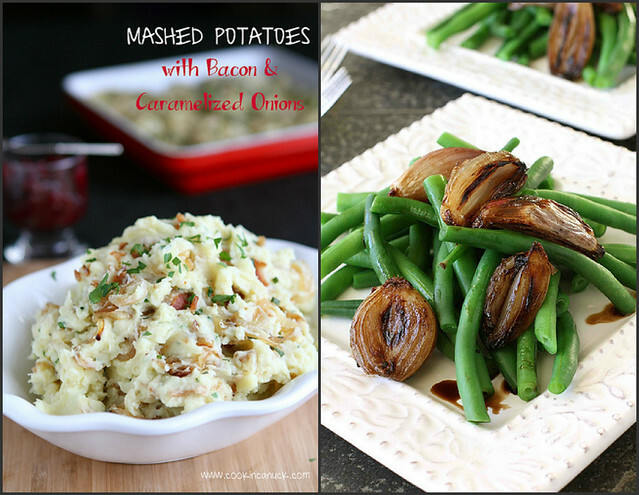 Thanksgiving side dish, for sure! I’ve drizzled some honey over my roasted brussels sprout before so I know THIS with the cinnamon and cranberries is going to be amazing!! Trying this recipe!! and LOVE! These look fabulous. I must confess my crew doesn’t get enough exposure to brussels sprouts. I’m definitely going to make this for them! I’m eating brussel sprouts AS WE SPEAK. Agreed – the charred bits ARE the best part! I’m 100% convinced that the reason people claim to hate brussels sprouts is because of those boiled or steamed versions (or worse – the FROZEN ones). Your roasted sprouts are making me hungry, Dara! Oh yes, roasting is the ONLY way to make brussel sprouts and they are like candy. I never make enough for the family. I love how you added cinnamon, almonds, and cranberries to the mix. I must give it a try! I too am traumatized by the boiled sprouts (and other veggies) of my youth! The crazy part is my dad had an enormous garden…waaaay before anyone I knew of, everything came out of it. Just think farm to table but everything was boiled to death, lol! I say the more charred the better! Mmmm! You added cinnamon! How interesting, I so have to try that! I absolutely LOVE brussels sprouts! I realize I am in the minority, but I don’t care. More for me! I’m with you about roasted Brussels sprouts. That’s the only way I do them these days (other than raw in salads), and now I like them. I like bitterness in my beer but not in my Brussels sprouts. The way I do it is tossed with olive oil and black pepper. These sound like a great variation – all dressed up for special occasions. I just love this recipe, it’s so gorgeous. I grew up never eating salads or many vegetables. We ate the same 3 all the time. Now that I’m older I love trying new recipes with all kinds of veggies. I can’t wait to sprinkle some cinnamon on my next batch. 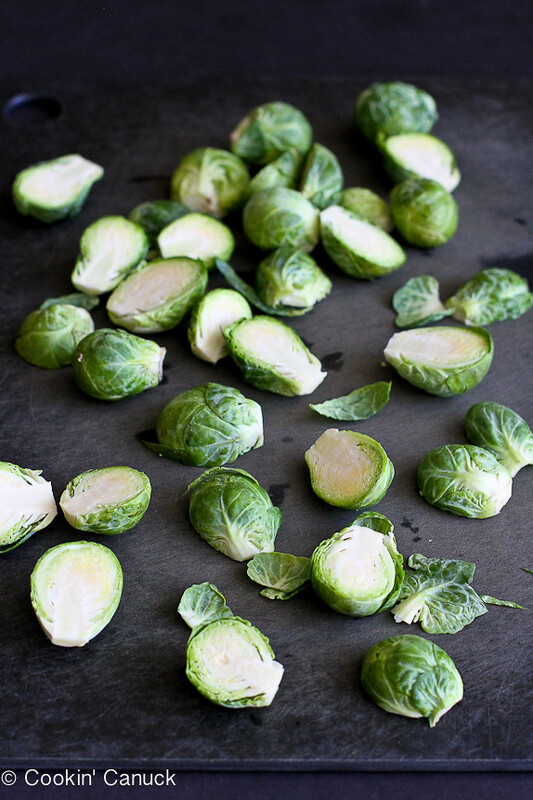 Gorgeous photos, the brussels sprouts just pop off the screen. Okay. I’m sold. I’m putting cinnamon on the next Brussels I roast! These look amazing. This looks wonderful. The charred bits ARE the best. I usually make mine with olive oil and pecans, but can”t wait to try this recipe for the holidays. Thanks for sharing! Oh, I love this!!! Brussels sprouts are one of my favorite vegetables but I never thought to put cinnamon with them! I love brussels sprouts but I’ve never put cinnamon on them. Definitely saving this recipe for my next round of roasting. It’s kind of cool, we never at brussels growing up. So I absolutely love them, they are one of my favorite Fall and Winter vegetables. The cinnamon, cranberries, and almonds are so festive and perfect for the holidays! These look so good! Love the addition of cinnamon! 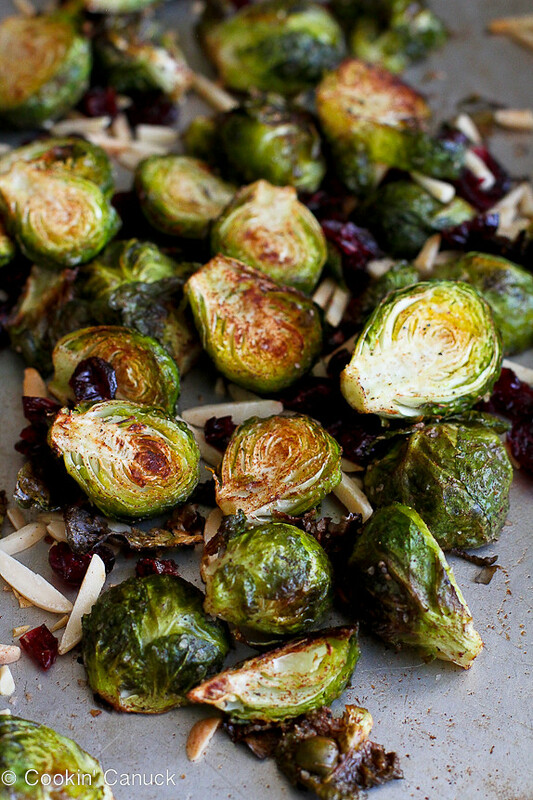 I love roasted brussel sprounts for the holidays – love that yours has a warming cinnamon kick to them! I love Brussels sprouts fried which many of the bars and restaurants here in San Francisco do really well (great with a beer!) someone just made me roasted Brussels sprouts with garlic and lemon this week and I am convinced that roasting is a great way to eat them! Love the idea of adding cinnamon! I’ve never eaten brussel sprouts & I made this recipe yesterday to take to my family dinner last night. They were awesome…Loved them & Loved the Char. What I didn’t like was the smell of my house when I came back home last night. Smelled like something was dead in there. Any suggestions for stinking my house all up? I love brussel sprouts! I am always so excited when I find them still on the stalk as well.. I have been roasting mine for a while, even though the older people around me want them boiled with butter and sugar in the water! GAG! I use lemon and bacon with mine but I have never heard of cinnamon! I can’t wait to try this recipe when my husband gets back in town! Thanks so much!!! It’s funny, I had brussels sprouts for the first time as an adult so I don’t have any bad memories. I’ve always had it in fancy, creative ways like this one which BTW I am loving the almond idea instead of any other nut. Awesome! I am planning on making these with a Parmesan garlic chicken breast. Will that go together? I LOVE brussels sprouts, but I always cook them with savory ingredients. Thoughts? Could I substitute pecans for the almonds? Wow! 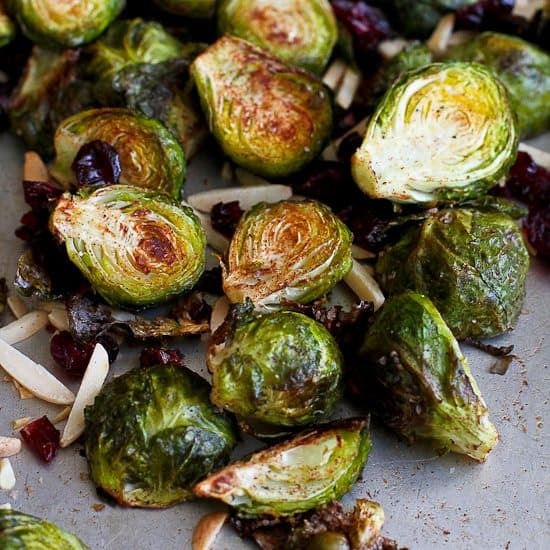 This cinnamon roasted brussels sprouts with toasted almonds recipe is incredible! I’m seriously so inspired right now. I need to add soy sauce to recipe and it would be perfect. Thx for sharing Dara! These cinnamon roasted brussels sprouts with toasted almonds looked soooo good, I had to try and make them. I used your suggestion and used 1/2 tsp ground cinnamon. I prefer healthy food! And I’ll definitely try that cinnamon roasted brussels sprouts. My husband would love it! Thanks and kudos for this awesome recipe. Oh my! This cinnamon roasted brussels sprouts with toasted almonds were delicious and so easy to make! Will have to try this for my family. Thanks so much!